At twenty John Bradley was sent to teach Aboriginal children in a school at remote Borroloola, on the Gulf of Carpentaria in far north Australia. But it is the teacher who is educated by the Yanyuwa elders and their families. Over three decades he learns their language and their country, becoming intimately drawn into other ways of being, both practical and spiritual. With passion and pride they teach him their songlines, relating what they know and value - ancestors, kin, allegiances; places, plants, animals; seasons, ceremonies, stories - and the spirit that sustains all. Through the song lines and teachings of the Yanyuwa people of Borroloola who adopted a young whitefella school teacher, 30 years on John Bradley finally felt capable of tackling the vast gulf between indigenous ways of knowing and the paternalistic prejudices flowing from the colonising conquests of post-enlightenment western ways of knowing. To a reader with relevant predisposition, the book succeeds in providing a powerful reference point, the real value of which is in its extrapolation across not just the once hundreds of other indigenous cultures across Australia but the many thousands across the world. Singing Saltwater Country explains how knowledge of place, nature and relationships is preserved through long ceremonial journeys, 'kujika', which are not just sung and danced in sacred rituals but are embedded in commentary and seen as actors in their own right to be negotiated with, alongside indigenous Law and rainbow serpents. I first became aware of the broad issue of reconciling the gifts of science with indigenous ways of knowing through the work of my 20 years ago masters supervisor in east Arnhem Land, not far away within the Northern Territory by Anglo Australian standards but as separated as places at similar distance had been in Europe when travel was predominantly by foot. Then in 2008, while I was publishing a family friend's stolen generation autobiography at my late mother's behest, an unrelated friend went north and took up a teaching position at Borroloola and soon alerted me to John Bradley's work. Borroloola is archetypical of settlements established across Australia where the indigenous inhabitants could be supplied with "immediate necessities", drawing them off their country which the colonists could then carve up with their titles, leases and cattle. Traditional knowledge became broken as too many elders died too quickly through introduced disease, genocidal violence or loss of will. Incessant preaching of a particularly authoritarian mythos from a faraway desert tribe weakened resistance to imposed change, so the dead could be buried in town cemeteries rather than having their bones ritually returned to their country in hollow log coffins. Also typically, Borroloola forced into much closer contact four groups each with their own language, the living speakers of which are now down to single digits. The book centres on the efforts of surviving and more recently deceased elders to work with Bradley to record and present their kujika using such relatively old technologies as drawing, writing and tape recorders, more recently extending to computer animation, in the hope that they will at some point be a valued resource for their own future generations. There are early encouraging signs towards the end of the book. There is much in their traditional knowledge of the now mostly protected but still vulnerable dugongs and sea turtles which is consistent with our scientific knowledge, including suggestions of detail which science would often not bother with but which were essential for the sustainable use of ecosyetem resources over many thousands of years. We have more to learn from them than they have from us. As a young man in his twenties, author John Bradley became a school teacher in the Aboriginal community of Boroloola, in far northern Australia. Bradley was immediately fascinated by the intricate, complex, and spiritually rich connections between the local Yanyuwa people and their homeland. Perhaps more importantly, the Yanyuwa opened themselves to Bradley, wisely selecting him to learn and document their lives, their traditions, their language, their songs, and their spirituality. They took him into their homes and guided him through the sprawling arid land and seacoast that is their heritage. As we learn in this truly beautiful book, Bradly was the perfect choice. He has now dedicated 30 years to an immersion in Yanyuwa ways of life, working in service to the people and their culture. Not only is Bradley a gifted learner, he is also a very talented writer. 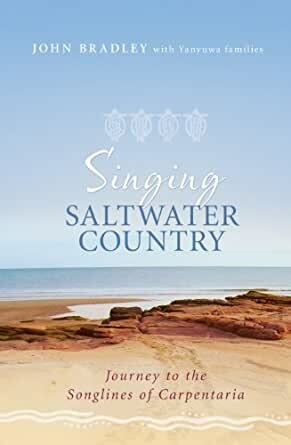 SINGING SALTWATER COUNTRY is an extraordinary blend of ethnographic information, sensitive portrayals of individual people, engaging stories, and eloquently evocative prose. The book a first person account of Bradley's experiences with Yanyuwa people and their country. Woven into these stories are details of the brilliantly complex, exquisitely poetic "songlines" that weave Yanyuwa people into their homeland. It is, above all, a celebration of Aboriginal culture and an evocation of the intellectual achievements of Yanyuwa people. As we might expect, there is also a thread of sadness over the passing of Bradley's elder-teachers and the dwindling of the traditions that they have struggled to maintain in an era of accelerated change. To his immense credit, Bradley has given himself completely to the task of preserving and transmitting Yanyuwa knowledge, in hopes that future generations of Yanyuwa will want (and perhaps urgently need) to know. As a North American cultural anthropologist and ethnographer, I have read stacks of books about indigenous people around the world. In my opinion, SINGING SALTWATER COUNTRY might be the best among them all. This is not just a book, it is an ethnographic and literary achievement. Furthermore,traditions like those of the Yanyuwa people are perhaps more than simply interesting, they might also be important, in an era when industrial culture treats our sustaining environment as a limitless resource unworthy of moral or ethical consideration. Indigenous cultures teach a very different and far wiser perspective, as Bradley's book so eloquently demonstrates. 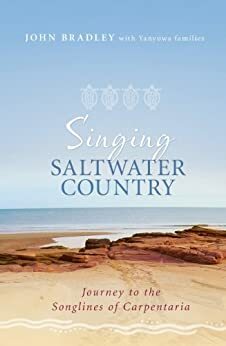 I strongly recommend SINGING SALTWATER COUNTRY to anyone who is fascinated with Australia and its First Peoples, as well as indigenous cultures and their connections to country, their religious and intellectual traditions, their exquisitely complex social relationships, their character and generosity, and their willingness to invite respectful outsiders into their world. And I recommend this book as a model for the very best that can be said about anthropology and about those anthropologists who are not only attempting to document the richness of human culture but also to preserve this richness for all of humankind, and to protect the rights of indigenous people to their heritage and homelands. Congratulations to John Bradley and his Yanyuwa teachers for the gift of this book. I will not rewrite what has been written above in the comprehensive reviews by Tony Smith and Nels, just endorse them and add my bit. I am just completing my doctorate on the way knowledge is maintained in oral tradition - especially pragmatic information such as animal behaviour and classifications, plant identification and properties, navigation, genealogy, astronomy and time keeping, seasonal information, laws, resource rights ... a vast store of pragmatic information on which survival depends. I am then applying this understanding to the archaeological record of enigmatic ceremonial sites around the world. Without writing, to store so much information and not lose it requires complex information structures. It's been a hard struggle even starting to understand how a completely different way of knowing and structuring information works. Basically, how do they remember so much stuff without writing? This book was instrumental in my gaining that insight. It is simply brilliant, and is the result of the trust between Bradley and the Yanyuwa people. To gain this level of understanding takes decades - decades that the rest of us don't have because there are so few Elders left with a complete depth of indigenous knowledge. Decades that very few would be willing to commit to such a difficult task. I am so grateful that John Bradley did just that. As one Aboriginal Elder told me, the songlines are 'simply a set of subheadings to our entire knowledge system.' Bradley shows exactly how that works, and does so beautifully. I cannot recommend this book highly enough.